Looking to go electro in the new year? 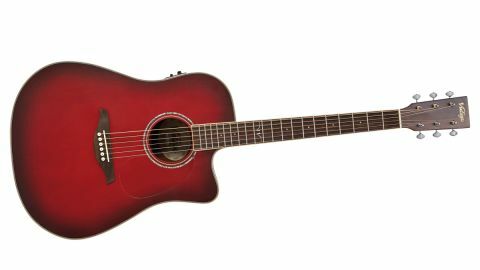 If the new year brings with it resolutions to get out there and play as an acoustic troubadour or band leader, the VEC501 could certainly help make them a reality. Great value. Excellent sound quality. The decision to buy an electro-acoustic is usually a commitment to having a guitar you can use live. It keeps your options open, with a guitar capable of being more than a go-to for the house. But Vintage's latest model wants to expand your horizons even wider with USB connectivity, which throws an additional recording option into the mix. We'll get to that soon, but first, let's look at what kind of dreadnought the VEC501 is. The finish instantly grabs our attention; the Satin Burgundy Burst sets itself apart in the sea of natural finishes in the entry-level electro market. There are more traditional options available in the range, but we like this shade's distinctiveness, subtle class and practicality. It's tasteful, reserved and solidly built all round, in fact - save the divisive Vintage 'V' inlay at the 12th fret. The cream binding works well with this finish, too. "There's an onboard tuner, too, so there's no excuse to commit that cardinal sin of open-mic nights." Let's get down to business. The action here is low, and it's going to please anyone who's used to an electric. Low usually means buzz, but even in DADGAD, there's none to be found, and the cutaway means it's an inspiring player all the way up the 'board. There are sparkly highs and resonant mids as you strum, but they're let down a little by a comparatively lacking low-end for a body of this size. This is emphasised when you need more projection for fingerpicking. The action contributes to that to some degree, but plugging in reveals hidden depths. Fishman's Isys preamp with Sonitone piezo again shows itself to be impressive and dependable, producing enhanced bass notes and resulting in a well-balanced sound. Even with the bass control at 12 o'clock, it delivers the goods for chord work through our Laney A1+ combo. The treble control and phase button allow further fine-tuning to suit your style.There's an onboard tuner, too, so there's no excuse to commit that cardinal sin of open-mic nights. The recently-reviewed Martin GPX1AE brought USB connectivity for direct recording to your computer and it's here on the VEC501, too. You should see it more as a bonus than an essential feature, allowing you to get an idea down in a noisy environment. We find the output through the mini-USB markedly higher compared with recording in GarageBand from the jack into an interface. But all the caveats of piezo-driven electro-acoustics are also amplified in this scenario; the plastic-y zing is no competition for mic'ing, even with some sensitive use of reverb and EQ. But where mic'ing isn't an option, this is another recording solution on an already well-priced instrument.